Maps fight a good war. Geographic intelligence has always been a pre-requisite for battle, whether in the form of Ezekiel’s clay model of Jerusalem or a digital terrain model from a reconnaissance drone. The year 2014 marks one hundred years since the outbreak of World War I, a global conflict which began on 28th July 1914 and ended on 11th November 1918 with a cost of 16 million lives and the downfall of four Empires in continental Europe. After the German army had invaded neutral Belgium and Luxembourg, their march on Paris was halted and what became the Western Front fell into a battle of attrition with a line of trenches that changed little until 1917. 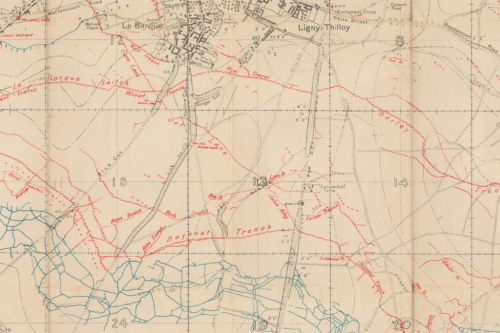 When the British Expeditionary Force (BEF) crossed the English Channel in August 1914, it relied upon on existing maps at 1:40,000 (Belgium) or 1:80,000 (France) and some at smaller scales, which were useful for planning troop movements, but not for the largely static war of attrition that required a more detailed knowledge of enemy defensive positions. 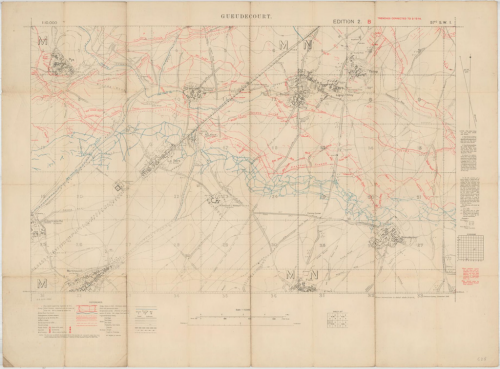 From early 1915 the Geographical Section of the General Staff (GSGS) at the War Office began to produce new, larger-scale maps for the fighting units at the Front. 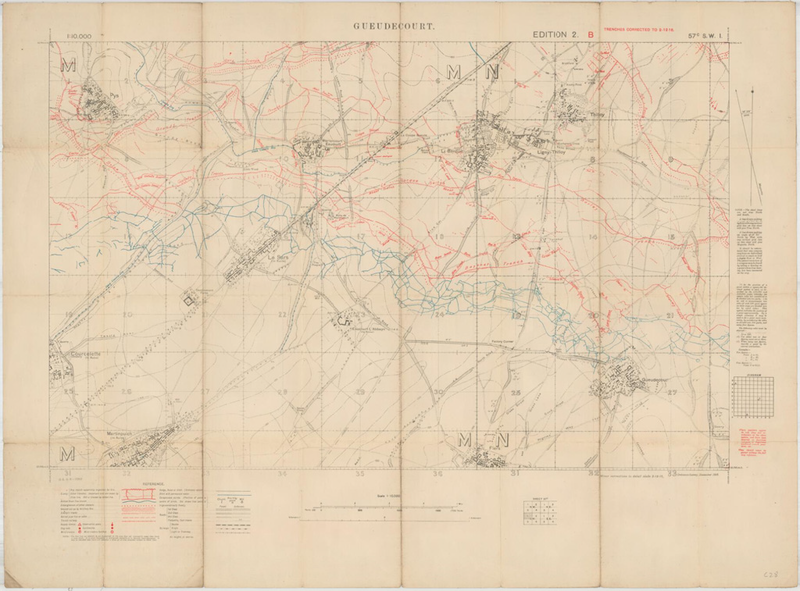 At a scale of 1:10,000, the new maps could reveal details of the enemy Front Line, machine gun posts, bunkers, communication trenches to the rear and any defensive positions. Small teams of Royal Engineers and Ordnance Survey surveyors gradually grew into larger field survey companies who could correct, print and distribute maps from the British lines. The Battle of the Somme, fought by the British and French forces against Germany from 1st July to 18th November 1916, was one of the largest battles of the war and claimed over one million casualties. 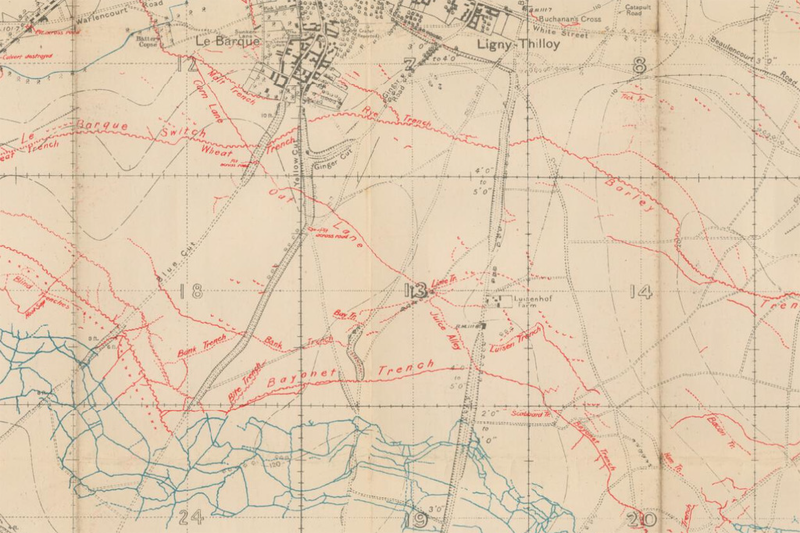 The 1:10,000 sheet shown here, Gueudecourt, depicts the trenches as on 2nd December 1916, with German positions in red and British/French in blue (as was the standard until these colours were reversed in early 1918). Gueudecourt was one of the most distant objectives of the British during the Battle of the Somme. The village saw decisive action from the Royal Newfoundland Regiment, who played a key role in capturing and successfully defending a German strong point. A memorial near the village, comprising a bronze caribou standing atop a cairn of Newfoundland granite, commemorates their achievement and sacrifice. It’s not always the case that those closest to the geography are those that either make or use the maps. Plenty of examples of covert mapping operations litter history, particularly military history. 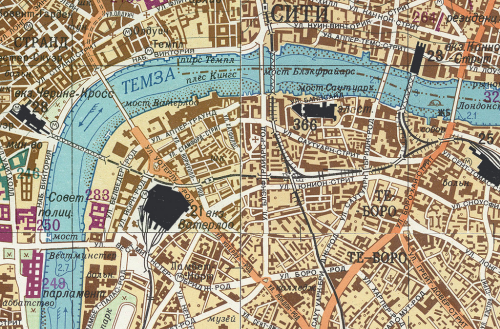 During the Cold War, the Military Topographic Directorate of the Soviet Army General Staff conducted a secret global topographic mapping program on a vast scale. The true extent is yet to emerge, but the availability of global and regional map indexes together with map sheets at 1:15,000,000, 1:2,500,000, 1:1,000,000, 1:500,000, and 1:200,000 scales, with further territories (including areas within the British Isles) covered at 1:100,000 and 1:50,000 scales, suggests that this was probably the most comprehensive and systematic cartographic project ever undertaken. In addition, the production of thousands of street plans of towns and cities around the world at large scales, such as 1:25,000, 1:15,000, 1:10,000, and 1:5,000, have come to light since the collapse of the former Soviet Union in 1991. 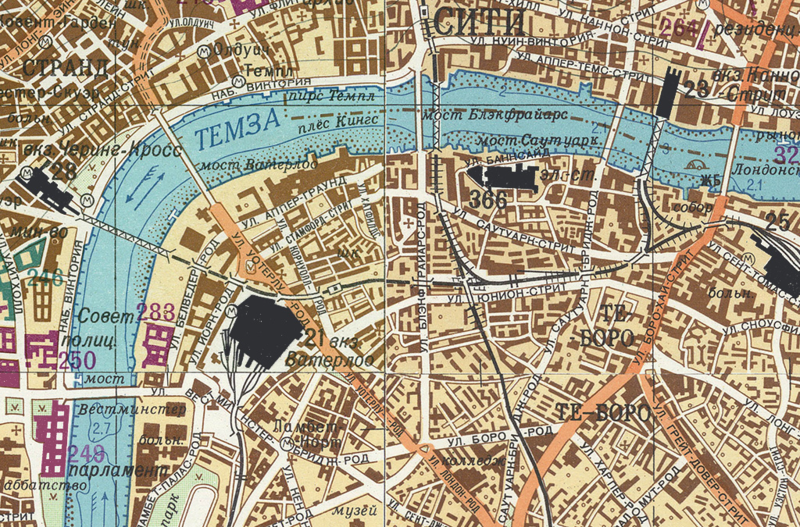 These include Paris, Berlin, Helsinki, Dublin, Vienna, New York, Los Angeles, Dakar, Luanda, and Cairo, and many others around the globe, all produced to standard specifications and using a variety of source material, including satellite imagery. 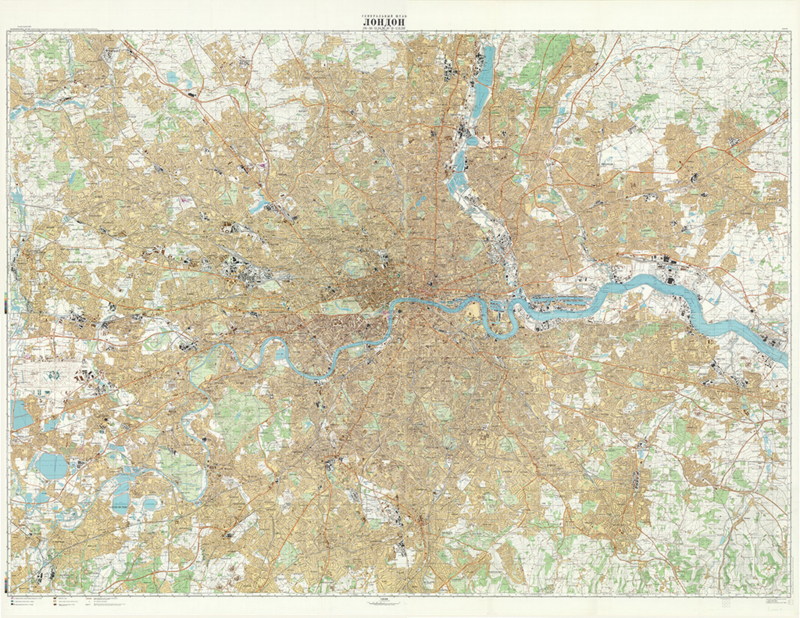 Over 90 towns and cities were mapped in the British Isles, including London, which is shown here. The plan comprises four sheets, which join together once the inner margins have been cut away. The astonishing level of detail includes the identification of strategically important buildings and their classification according to their use (e.g. military buildings shown in green, governmental and communications in purple, and military industrial as black). 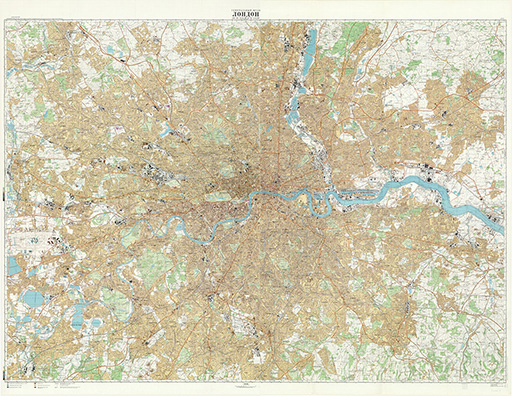 This extract lies at the centre of the four sheets and includes the Houses of Parliament (bottom left, in purple) and several of the city’s railway stations (in black). At a distance the maps might appear similar to the sort of standard topographic sheet you’d expect but the typographic detail makes plain the authorship. The sources used to compile the detailed hydrography and the construction material of bridges and their height above water (which can be found on many of these plans) remain unknown and it is not unlikely that direct observation played a role. That so much geographical detail was mapped at a time when the obliteration of many of these cities seemed a real possibility is the paradox of the programme’s amazing legacy. Designed for a very specific purpose. Executed with considerable expertise and care in the look, feel and accuracy of the finished product. Not bad for a map created on foreign soil without anyone’s knowledge.